Do cavities, damaged restorations, or missing teeth have you wondering what’s next for your smile? Masella Family Dental provides comprehensive restorative treatments that meet every dental need and budget. Unlike most dental offices, we provide many types of services right here in our office, preventing the need to refer you to a specialist. Composite fillings blend in with your smile, and require less tooth preparation than traditional amalgam (silver) fillings. Every filling is custom-shaded so that it matches your natural tooth color. You can even elect to have old fillings replaced with this more aesthetic restorative material. If your tooth is too badly damaged for a filling but doesn’t need a full-coverage crown, then an inlay or onlay is exactly what you need! These lab-manufactured restorations are customized to restore large portions of teeth while also maximizing the amount of healthy enamel that is still present. Badly damaged teeth that have experienced large cavities or fractures can be very susceptible to damage during everyday use. Crowns are full-coverage restorations that protect the remaining portion of the tooth, as well as allow it to continue functioning normally. Masella Family Dental uses the newest materials and our crowns don’t have the unsightly metal understructure. We offer both zirconia and newest E-Max crowns, so that your restoration looks just like your real tooth. Removable dentures and partial dentures are an easy way to replace all of your missing teeth at one time. These appliances are worn in the day, and removed overnight. The prosthetic teeth are handcrafted in a lab so that they look great and feel comfortable. We offer both implant placement as well as restoration of existing implants. Implants are perfect for replacing missing teeth. Single, multiple, or all teeth can be replaced with implants. These devices provide a strong, permanent alternative to removable dentures. Endodontic therapy is used to restore and preserve teeth that have experienced nerve damage or infection. The nerve tissue is removed from the tooth, and a filling material is placed into the nerve chamber. 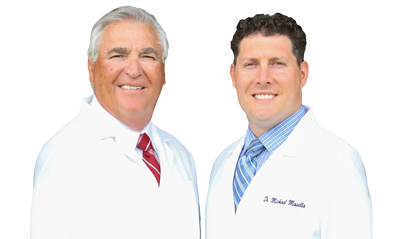 Most dentists limit the types of teeth they treat with root canals, but Drs.Tom and Mike Masella provide full-service endodontics for every type of tooth. Our dentists perform the majority of oral surgery treatments here in our private practice. They include routine extractions as well as surgical extractions for impactions such as wisdom teeth. We put our patients’ comfort first, so you can rest easy and know that you’re in good hands.